Where does journalism fit in the media landscape of blogs, tweets, Facebook postings, YouTube videos, and literally billions of Web pages?Public Journalism 2.0 examines the ways that civic or public journalism is evolving, especially as audience-created content-sometimes referred to as citizen journalism or participatory journalism-becomes increasingly prominent in contemporary media. As the contributors to this edited volume demonstrate, the mere use of digital technologies is not the fundamental challenge of a new citizen-engaged journalism; rather, a depper understanding of how civic/public journalism can inform citizen-propelled initiatives is required. 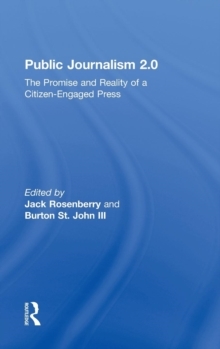 Through a mix of original research, essays, interviews, and case studies, this collection establishes how public journalism principles and practices offer journalists, scholars, and citizens insights into how digital technology and other contemporary practices can increase civic engagement and improve public life. Each chapter concludes with pedagogical features including:* Theoretical Implications highlighting the main theoretical lessons from each chapter,* Practical Implications applying the chapter's theoretical findings to the practice of citizen-engaged jouranlis, *Reflection Questions prompting the reader to consider how to extend the theory and application of the chapter. blogging and other participatory journalism practices enabled by digital technology are not always in line with the original vision of public journalism, which strives to report news in such a way as to promote civic engagement by its audience. Public Journalism 2.0 seeks to reinvent public journalism for the 21st century and to offer visions of how digital technology can be enlisted to promote civic involvement in the news.